IGP orders immediate removal of illegal roadblocks in Nigeria – Royal Times of Nigeria. 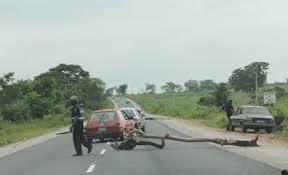 The inspector General of Nigerian Police Mr. Ibrahim Idris, has ordered an immediate destruction of illegal roadblocks across the country, including other obstructions on public highways and roads created by unlawful revenue/tax collectors, road transport unions, labour and trade related unions inhibiting vehicular movement and smooth passage of passengers and goods, and other road users. The Force Public Relations Officer, Jimoh Moshood in a statement on Sunday, said to this end, the IGP has deployed the police Special X-Squad team across the country to commence, with effect from today, the removal of all forms of illegal blockage on the roads and to arrest, investigate and prosecute any person or group of persons found committing the illegal act.